This form is a real estate purchase contract for an office building leased to third party tenants. The agreement provides for a closing sixty days after the contract is signed, during which the buyer conducts its due diligence for the purchase. A. Seller owns certain real property located in __________ County, ______________ and more specifically described in Exhibit A attached hereto (the "Land"), commonly known as the __________ and such other assets, as the same are herein described. B. Subject to the terms and conditions in this Agreement, Seller desires to sell to Buyer and Buyer desires to purchase from Seller the Land and the associated assets. 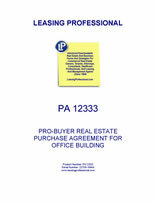 1.5 To the extent transferable, all building permits, certificates of occupancy and other certificates, permits, consents, authorizations, variances or waivers, dedications, subdivision maps, licenses and approvals from any governmental or quasi-governmental agency, department, board, commission, bureau or other entity or instrumentality relating to the Property (the "Permits"). Within three (3) business days of the Effective Date, Buyer shall deposit into Escrow the amount of _____________ Dollars ($_________) (the "Deposit"), in the form of a wire transfer payable to ________________ ("Escrow Holder"). Escrow Holder shall place the Deposit into an interest bearing money market account at a bank or other financial institution reasonably satisfactory to Buyer, and interest thereon shall be credited to Buyer's account. 2.2 On or before Closing, Buyer shall deposit into Escrow the balance of the Purchase Price, by wire transfer payable to Escrow Holder. During the Inspection Period (hereafter defined) Buyer shall review and approve the Title Documents (hereinafter defined) and the Survey (hereinafter defined). If the Title Documents or Survey reflect or disclose any defect, exception or other matter affecting the Property ("Title Defects") that is unacceptable to Buyer, then prior to the expiration of the Inspection Period, Buyer shall provide Seller with written notice of Buyer's objections. Seller may, at its sole option, elect to cure or remove the objections made by Buyer. Should Seller elect to attempt to cure or remove the objection, it shall be a condition precedent to Buyer's obligation to acquire the Property that Seller cures such title objection prior to the Closing. Unless Seller provides written notice to Buyer before the expiration of the Inspection Period that Seller intends to cure Buyer's title objections, Seller shall be deemed to have elected not to cure or remove Buyer's title objections, and Buyer shall be entitled, as Buyer's sole and exclusive remedy, either to (i) terminate this Agreement and obtain a refund of the Deposit by providing written notice of termination to Seller before the end of the Inspection Period and returning the Due Diligence Items (hereinafter defined) or (ii) waive the objections and close this transaction as otherwise contemplated herein. If Buyer shall fail to terminate this Agreement during the Inspection Period, all matters shown on the Survey and all matters described in the Title Report, except for monetary liens for indebtedness of the Seller and any matters the Seller has agreed to cure in writing, shall be deemed "Permitted Exceptions." 4.1.7 An inventory of all personal property located on the Property, used in the maintenance of the Property or stored for future use at the Property and an inventory of all furniture and appliances used in the units, if any. 4.2.1 All site plans, leasing plans, as-built plans, drawings, environmental, mechanical, electrical, structural, soils and similar reports and/or audits and plans and specifications relative to the Property in the possession of Seller, if any. 4.2.2 The tenant files, books and records relating to the ownership and operation of the Property.